I enjoyed working with such a small form, the enforced economy focusing down my ideas. I tend to be attracted to poetry at an aural level, so concrete poetry isn’t generally my thing but I like the idea of it. Before looking it up for this post, I hadn’t realized that the term ‘concrete poetry’ was so recent (the 1950s) or that it had ever been held up as an avant-garde mode. I tend to think of it as old (because George Herbert’s “Easter Wings” is so anthologized) and as being childish (because it’s a form taught to children a lot). The theory, for the Niogandres group, was that concrete poetry foregrounded the materiality and specificity of the words, rather than allowing words to disappear behind the ideas they convey. I must admit, I’m not really sure how this works – I guess by dislodging the word from the line makes more strange, more visible? It’s interesting, too, that the Niogandres group thought poetry needed shaking up into a visual form to achieve this effect. The Russian Formalists claimed, some thirty years earlier, that poetry – all and any poetry – worked to estrange language, to make it anew from the dead metaphors of prose. My cursory research doesn’t indicate whether or not the Niogandres poets were responding to the Russian Formalists, but I’d like to think so. In writing this – constructing it? – I somewhat returned to chance operation. I used a word cloud generator with customizable shapes and plugged in a short piece I wrote apropos of the recent and very sudden burst of new growth we’ve had here. This debt we pay to human guile. And all their myriad voices. Sources: T. S. Eliot, Robert Herrick, Paul Laurence Dunbar, William Wordsworth, James Merrill, Archibald MacLeish, Sharon Olds, Joan Fleming, Emily Bronte, Allen Ginsberg, Charles Brasch, Gerard Manley Hopkins. This was a fun one – a lot of reading around eclectic places and piecing bits together like a jigsaw. I started off by just reading around for anything that caught my eye, with no overall plan. After a while I decided to use “you” and “I” as a connecting thread, since so much poetry is built around this kind of direct address. With that in mind, I gathered a few more pieces and then strung together something rough which I filled out by specifically hunting for a few connecting lines that fit with what I already had. I was pretty indiscriminate about where I took lines from, although I can see that restricting yourself to a specific group of poets or poems would be a great way to approach this. There are some limits in terms of keeping a reasonably consistent style and tone (if that’s something you want to do), which here meant working within a relatively modern Western tradition of works. Also, if you don’t know Joan Fleming’s work already, check it out. She’s great. I guess this is sort of the point, but this poem was kind of boring for me – all I did was pick out a section of text (from Mervyn Peake’s amazing Titus Groan) and run it through an online randomizer. What I did have fun doing is working this randomization into something coherent and poem-like. I was going to post that worked up version, since that seems to be what some people do when the publish chance operation poems, but I felt that missed the point of removing the poet and creating space for the reader to find their own patterns of meaning. 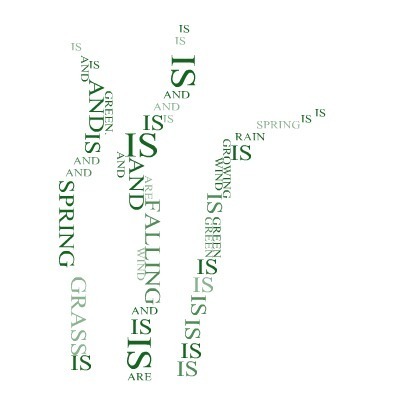 This poem and next week’s cento have lined up perfectly with The Found Poetry Review‘s National Poetry Month project, Oulipost – they’re giving a new prompt for constrained writing techniques applied to text sourced from newspaper. For the original text and my shot at making something coherent out of the randomization, see below the jump.